Feed your strap end through one slot in the slide, around your frame pipe, and back up through the other slot in the slide. 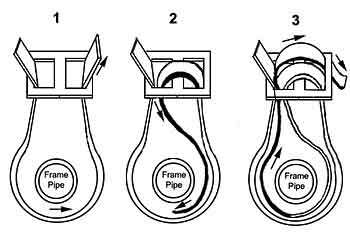 At this point, keep the loop very loose, with plenty of space between the loop and the frame pipe. Now go down through the first slot and back around the frame pipe in the opposite direction. You will be creating a second loop inside the first one. Bring the end of the strap back up through the first slot and down through the second slot. Now tighten the double loops around the frame pipe. As you do so, be sure to leave enough slack in the strap to go under whatever you are tying down, AND enough end on the strap to be able to loop back over your load and reach back to the buckle.